Spring Swim Lessons Are A Hit! SDMS is very proud of our youngest Seahawks! The first-ever Spring Swim Lessons class is wrapped up last night (May 21st). All the kids worked hard and learned a ton about swimming. SDMS is also excited to offer evening lessons during the summer for the first time! With two class options for each session, it’s a great chance to help young children learn swimming technique. Register by clicking the “Register Now” link in the right-hand column or by visiting the online shop. 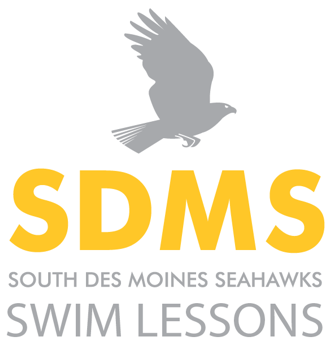 The SDMS lessons program is for young swimmers ages 3-9 to begin learning the basics of swimming. Each class will have an in-water instructor and the program is designed for children who are new to the water. Each class is separated into three smaller classes, Goldfish, Sting Ray and Dolphin (if applicable). You can read more about each class below. Classes will be divided at the first practice; there’s no need to choose one at sign up. Goldfish: This class is to learn the most basic skills. Students will be taught to put their head underwater, blow air out their nose, float, basic arm and leg movements and more! This would be great for our youngest learners who are graduating from the bathtub to the pool. Sting Ray: This class is for intermediate learners. Students will begin to learn more advanced skills and start to get more comfortable in deeper water. They will learn the basics of freestyle and backstroke, breathing to the side, and many other skills. This class strives to teach confidence and safe swimming in all water depths. Dolphin: This class is for more advanced swimmers. These swimmers will work on learning all four strokes, starts from the side of the pool and blocks. They will also work on breathing and will strive to swim longer distances (one full length). Upon graduation from this class, your child will be ready to join the competitive team in the novice division.